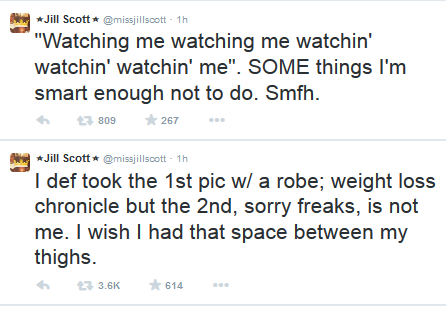 Was Jill Scott hacked? There are some nudes floating around social media that are allegedly exposing the Philly Native. We have the scoop on whether it's her or not when you go inside…. 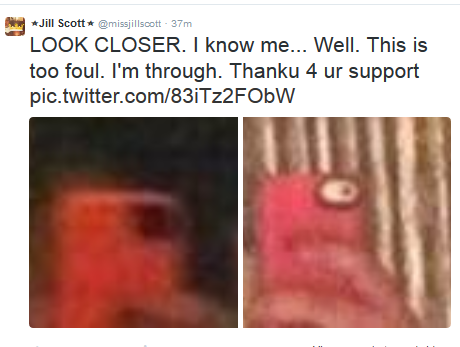 There are some pics making their rounds on Twitter that are allegedly of Jill Scott. Could she be one of the celebrity victims who had their personal accounts hacked? It’s possible. It’s alleged that a massive celebrity photo hack scheme is currently in the works and they’re slowly leaking nudes. It already happened to actress Jennifer Lawrence (although the authenticity of some of the images couldn’t be confirmed) and now it appears Jilly could be their next victim. According to CBS Los Angeles, the FBI is now investigating the huge hack. Whomever photoshopped the pics forgot to "change" the phone. Tsk Tsk Tsk.